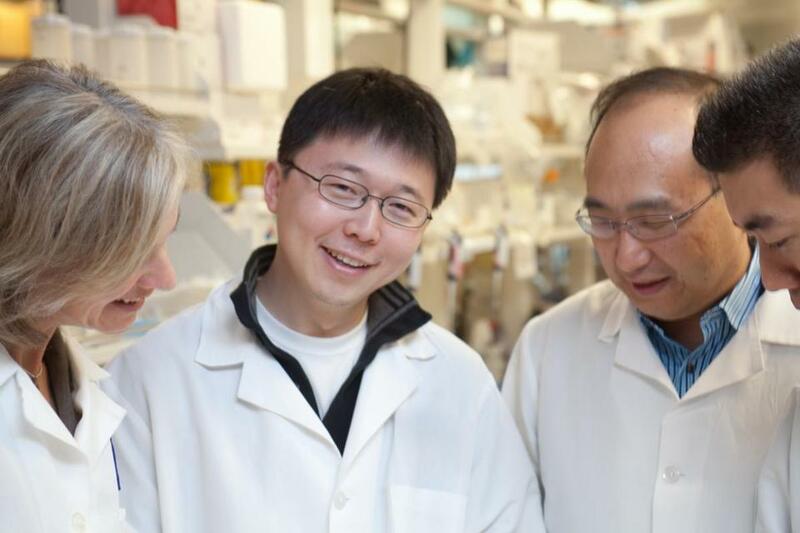 MIT professor and brain researcher Feng Zhang (center) is a cofounder of Editas Medicine. Editas Medicine Inc. is poised to become the first company to go public in the United States this year after selling $94.4 million in stock on Tuesday, according to research firm Renaissance Capital. But the initial public offering, sealed on a day when stocks fell sharply, came at a cost: the Cambridge biotech company priced the shares at $16 apiece, at the bottom of its anticipated range of $16 to $18. Editas sold 5.9 million shares. The IPO reflects the volatile state of financial markets. The Standard & Poor’s 500 Index has fallen 6.9 percent this year amid a steep drop in crude oil prices and on concerns that global economic growth is slowing. There were no US IPOs in January, the first month that’s happened since September 2011, and the last biotech IPO took place Nov. 19, when Asome Therapeutics Inc. of New York raised $51 million to develop a drug to treat chronic pain. Tuesday’s transaction was nonetheless a signal to the biotech industry, the leading engine of IPOs over the past three years, that going public remains an option for some companies after several slow months. Editas shares will start trading Wednesday on the Nasdaq under the symbol EDIT. Editas Medicine Inc. develops treatments to modify genetic defects, a hot area of biotech research. At the same time, the IPO raised questions about whether Editas, one of a trio of Cambridge biotechs working in the hot field of gene editing, is a bellwether or a special case that drew investors because it’s working on breakthrough science with the potential to transform drug discovery. Editas is a pioneer in an emerging approach called CRISPR-Cas9, which uses a kind of molecular scissors with “potential to achieve precise, directed changes in DNA,” enabling it to potentially modify as many as 6,000 disease-causing genetic defects, according to a company filing with the Securities and Exchange Commission in advance of its IPO. But the filing makes it clear the company faces significant risks, including an ongoing patent suit and the possibility that governments might restrict how the technology can be used because of safety or ethical qualms. “Adverse public perception of genomic medicine, and genome editing in particular, may negatively impact regulatory approval of, or demand for, our potential products,” it said. Editas is also selling shares in the aftermath of a stock market route that has sent the Nasdaq biotech index down more than 20 percent since the start of the year. Financial markets tumbled again Tuesday, with the Dow Jones industrial average losing 1.8 percent and the Nasdaq giving up 2.2 percent. But Editas has gained momentum in the past year as it positioned itself for an IPO. Last August, it raised $120 million in a private investment round that included blue-chip names such as Fidelity Investments and a fund backed by Microsoft Corp. founder Bill Gates. That financing round underscored growing interest in gene editing and the CRISPR-Cas9 approach being pioneered by Editas and its two Cambridge rivals, CRISPR Therapeutics and Intellia Therapeutics Inc. All three companies have struck partnerships with larger biopharma players, and all are competing to capitalize on intellectual property that is the subject of global patent litigation. Editas has an alliance with biotech Juno Therapeutics Inc. of Seattle, while Intellia collaborates with Swiss drug giant Novartis AG, which bases its global research operation in Cambridge. CRISPR is working with Boston’s Vertex Pharmaceuticals Inc. and Germany’s Bayer AG. While Editas has licensed its technology from the Broad Institute of Harvard and the Massachusetts Institute of Technology, CRISPR and Intellia are both using technology that emerged from labs at the University of California in Berkeley and the University of Vienna. “Some of our owned and in-licensed patents and other intellectual property are, and may in the future become, subject to priority or inventorship disputes,” the Editas filing warned. Editas chief executive Katrine Bosley and other executives declined to discuss the IPO, abiding by a “quiet period” imposed by regulators, a spokesman said. Another biotech, BeiGene Ltd. of China, had planned to price its IPO late Tuesday. It was seeking to raise about $127 million by selling 5.5 million American depositary shares at $22 to $24 apiece, according to regulatory filings. Correction: An earlier version of this story incorrectly reported that Editas had reduced the number of shares offering in the IPO.